September 22, 2016 September 22, 2016 Dan O. After spending some time in Congress and starting all sorts of controversy for his loud, sometimes arrogant demeanor and approach to certain situations, Democrat Anthony Weiner decides that it’s his time to take things one step further and head for Mayor of New York City. And to be honest, it seems as if Weiner has an actual shot at winning the job; he’s good friends with the Clintons, his wife, Huma Abedin, is loving and supportive, and his viewpoints on race, gender, and class make him all around beloved human being. However, it all comes crashing down when news surfaces that Weiner was on the internet, scouring the web and sending all sorts of naughty pics to gals that he would strike up conversations with. Of course, this isn’t the first time that Weiner got in trouble for his internet-usage, but it was the one time that everyone who loved and supported him, began to turn the other cheek and think long and hard about who they wanted to represent them. Either they wanted the strong-willed, determined family-man, or they wanted the strong-willed, determined dude who looked to look at dirty pics online? Oh and yeah, it’s all filmed. No, seriously. Like almost everything that you could imagine wouldn’t be filmed in a situation as tense and awkward as this, trust me, it’s filmed. It even gets to a point where the directors, Josh Kriegman and Elyse Steinberg, even ask Weiner himself why he’s allowing for them to film everything and, well, he hardly even gives an answer. This is meant to show that Weiner himself, doesn’t give a hoot what constitutes good or bad publicity – as long as the cameras are turned towards him, the lights are beaming down on him, and people are talking to him, then Anthony Weiner is more than happy to oblige to anything. Is that such a problem? The interesting aspect about Weiner, the person, that the documentary gets across very early-on is that he’s the kind of politician that only Aaron Sorkin still believes in and thinks can still exist; he’s loud, arrogant, brash and selfish, but at the same time, he cares about what he believes in, is very opinionated, and isn’t afraid to get down on the ground level with fellow human beings, making it seem as if everything he does, says and promises, well, he’ll make happen one day. 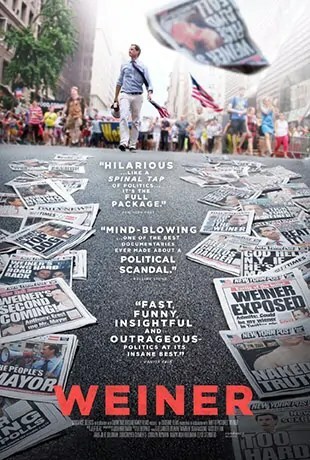 While watching the documentary, it’s not hard to think this, regardless of what political affiliation you may or may not have – watching someone like Weiner run around like a wild madman during his campaign parade is exciting and most of all, inspirational. It’s the sign of a true politician that believes in everything that he wants to do, even if some of it, sure, may be a little unrealistic. But once again, is that such a problem? And of course, that same question could be directed towards what he did in his spare-time – aka, what with the sexting and all that nonsense. The movie’s smart in that it never seems to be on Weiner’s side, nor does it ever seem like it’s totally against him; I would use the term “fly-on-the-wall”, in terms of their approach to the material, but Weiner himself makes a mention of it, so it’s kind of hard to compete. But yes, he’s got it right – this is on-the-fly, off-the-wall documentary film-making at its finest and it’s a testament to how passionate these film-makers were to getting everything that they could on film, regardless of if it was considered “rude”, or “unprofessional”. After all, their film-makers and film-makers have always been seen as “rude” and/or “unprofessional”. Hell, it’s in the blood. And due to the movie being a play-by-play of everything that’s happening, it’s not hard to get swept up in all the mayhem and drama, even when it seems all to excruciating to sit back, watch and relax. This is especially the case when you consider the fact that a good chunk of the film is literally watching as Weiner’s marriage falls apart right in front of our eyes, with him and Abedin hardly exchanging glances when in the same room, let alone actual words. It’s hard to watch, but you know what? It’s also incredibly watchable. Anthony Weiner wants us to see this for what it is and not really try to draw our own conclusions, even if there are certain things behind-the-scenes that do, or don’t happen and keep us guessing a little bit more. That said, the movie still does fall short of being perfection because there’s never any introspective given on behalf of Weiner or even the film-makers. Sure, we can make up our own conclusions about what was going through the mind of Weiner during this one time in particular in his life, but sometimes, it’s always best to get a raw, one-on-one interview with the person; to just see him doing things that he would do in his normal, everyday life, no matter how interesting, sometimes, isn’t enough. To hear what’s going on in his head and understanding the beast for what it is, honestly, makes the journey all the more interesting. Without it, it’s just watching a person do things that may be considered “self-destructive” or may not. Consensus: Short of perfection, Weiner is a gripping, exciting, compelling, and sometimes hard-to-watch documentary that paints its subject in an unforgiving light, yet, at the same time, also makes him out to be the person some of us never knew actually existed beneath all of the overblown controversy. There’s no E-I-N in “Weiner”. No, literally. I really enjoyed this film and reading your review. But you’re correct to point out the lack of introspection makes it feel a bit less special than it could have been. It becomes like watching a car crash. And there are points at which you just want to look away. Fly-on-the-wall is the perfect term to describe Weiner as a documentary. The filmmakers are neither for nor against him, showing both his positives as a politician and negatives as a human being. The filmmakers really capture some compelling footage, and I think you hit the nail on the head by saying that it’s hard to watch, yet incredibly watchable. I laud the filmmakers for showing so much of Huma Abedin’s perspective in what she doesn’t say. You really feel for her as a person both for the awful things that happen to her and for how she tries to make things work. I’m okay with the lack of introspection because this is a fly-on-the-wall movie and because it covers such an immediate period in time. I don’t think it leaves much room for introspection. Great review Dan. The key strength of the film for me is its strictly observational documentary format with neglible filmmaker intervention (the polar opposite of a Michael Moore style, for example). In fact the voice of the filmmaker is barely heard, and the “introspection” dimension is clearly evident and even amplified by the absence of any sign that Weiner is even capable of introspection or empathy. Sometimes the ‘counterfactual’ is the evidence (ie: what is not seen).